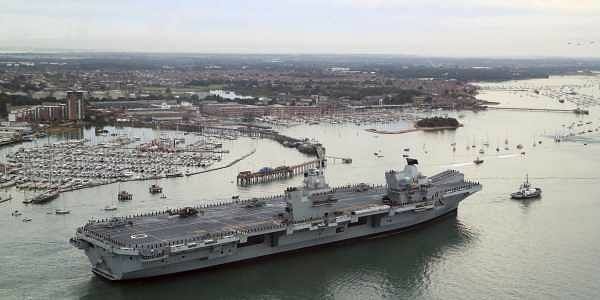 Britain's future flagship vessel HMS Queen Elizabeth, its biggest-ever warship, has sprung a leak, defence officials admitted Tuesday, only two weeks after it was commissioned into the Royal Navy. LONDON: Britain's future flagship vessel HMS Queen Elizabeth, its biggest-ever warship, has sprung a leak, defence officials admitted Tuesday, only two weeks after it was commissioned into the Royal Navy. Her Majesty's Ship Queen Elizabeth, which cost £3.1 billion ($4.1 billion, 3.5 billion euros) to build, has been taking on water for some time due to a problem with a shaft seal. The 280-metre long aircraft carrier, the most powerful ship Britain his ever built, is undergoing sea trials and is due to enter service in 2020. "This is the reason why we have the sea trials -- to make sure that everything is working absolutely perfectly," said Defence Secretary Gavin Williamson. "HMS Queen Elizabeth is the most magnificent aircraft carrier in the world. "She is going to make a significant difference as to what we can actually achieve and what we are able to do as a global power." The ship can operate with a crew of 1,000 and 40 aircraft on deck. It weighs 65,000 tonnes. The problem will be repaired when the warship is in dock at Portsmouth. Former senior naval officer Rear Admiral Chris Parry told Sky News television the leak was "no big deal". "Every ship, to tell you the truth, takes on water. That's why you have pumps," he said. In sea trials, "you stress it right to its extremes, and you're really looking for faults like this to see what happens". BAE Systems, which played a key role in the construction, said the ship could still sail and the problem would be rectified in the new year, a process expected to take a few days. Britain has been without any carrier strike capability since the government scrapped previous vessels in 2010 as part of austerity measures to curb a huge deficit. The project had been dogged by questions about the US-built F-35 jets, due to be deployed on the aircraft carrier, and about the need for mammoth aircraft carriers when Britain's military role in the world has diminished. Queen Elizabeth II commissioned the ship into the Royal Navy earlier this month. The ship is named after both the current monarch and England's Queen Elizabeth I, who reigned from 1558 to 1603. Its sister ship, the HMS Prince of Wales, is still under construction.